The Holiday Inn London - Kensington South has one of the most convenient locations in London for both tourist and business people. The nearby underground station at Gloucester Road offers a direct line to Heathrow Airport and to Victoria Rail Station, which has an express rail service to Gatwick Airport. Piccadilly, District and Circle lines are all accessible from Gloucester Road Tube station. Set in the heart of Kensington and Chelsea, and close to many of London's well known landmarks, is the Holiday Inn London - Kensington South. Nearby too are Harrods and Harvey Nichols and the other shopping attractions of Knightsbridge, with the famous King's Road within walking distance. Theatreland, the West End shops and the capital's many places of historical and cultural interest are also within easy reach. The hotel offers ten purpose-built conference and banqueting rooms, with 60 to 300 square metres of air-conditioned, flexible meeting space. Whether you are planning a large international conference, a banquet an AGM or a small business briefing, a training seminar or a product launch, or simply a confidential board meeting, these rooms are ideal. We make it our business to assist you in arranging everything to endure that your event is as relaxed, professional and as welcoming as possible. All the rooms have individually controlled air conditioning and separate bathroom, large desk including a second data port and International socket points, cable/satellite colour television, in room movies and playstation, radio, minibar, tea/coffee making facilities, iron and ironing board or trouser press, hairdryer. 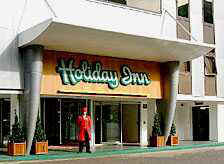 At the Holiday Inn London - Kensington South, they are known for having two main restaurants and a traditional English pub, all located with easy reach, in house. They also offer 24 hr Room service and all of our rooms have built-in mini bars. 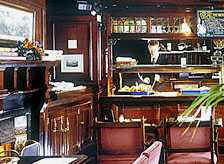 Since the mini bars have an automatic tracking system they provide immediate billing. Children of all ages are welcome to come and dine in our restaurants.